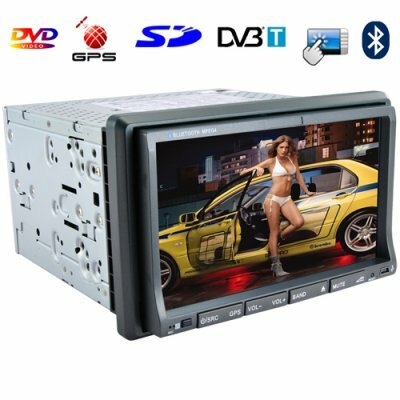 Successfully Added 7-inch Car DVD Player (GPS DVBT Dual Zone 2 DIN Touchscreen) to your Shopping Cart. Introducing the CVJY-C28, a total in-dash car navigation, entertainment, and communication solution that takes intelligent in-car enhancement systems to the next level! Next Level Navigation: This 2-DIN (100 mm tall) all in one car wonder comes standard with the Windows CE 5.0 mobile operating system to run today's most popular GPS software and software features like lane assist, voice guidance, 3-D views, intelligent route planning, points of interest, real time traffic and weather data, map update and share, and emergency response to your location. Also included is an extra long 3 meter GPS magnet antennae to significantly boost your GPS signal reception. Next Level Entertainment: This two-DIN multimedia powerhouse supports all the most popular disk formats like DVD, CD, VCD, SVCD and displays it all on 7 inch TFT LCD touchscreen splendor. It also plays multimedia files saved on SD cards and USB thumb drives like DIVX, XVID, AVI, MP4, VOB, MPG, MP3, WMA, and JPG. What's more, effortlessly plug in your Apple iPod to pump your personal media collection through your car's speakers. If that's not enough entertainment, watch DVB-T wherever it's available which is pretty well everywhere these days. Also included is a new and more powerful 20 cm high, 3 meter long coil-base magnetic DVB-T antenna which you can place on any magnetic part of your car to significantly boost digital television signal reception. Next Level Communication: This next generation mobile unit easily pairs with your Bluetooth-enabled cellphone so you can talk handsfree through its built in MIC and hear your caller through your car speakers. From your mobile phone's Bluetooth menu, simply press to detect Bluetooth devices in your area. Within seconds, "CAR KIT" will be displayed. Enter the password provided in the user manual and that's it. Hassle-free Bluetooth setup! What's more, the CVJY-C28 also comes with an advanced radio system for traffic announcements and rear video camera for optimal surroundings visibility. This new in-car total solution does more than same-class car DVD systems, but costs less as a result of Chinavasion's increasing market share in the car multimedia system business. So take advantage of our new factory-direct low price by purchasing one to transform your car into a home away from home or a mobile office and then buy some more to sell on your online store. At these prices, your profit margins will get a whole lot fatter. And as always this state of the art in-car enhancement solution is backed by Chinavasion's amazing 12 month warranty! Dimensions: 178 x 100 x 160 (Width x Height x Depth) (mm) Note: Front panel protrudes 20 mm from dashboard. Hi Sergio. Thank you for your question. Many customers like to make DIY fabric covers with elastic corners (similar to a bed matress cover) that they can design to look like the screen has been removed. Then they can just use this to cover over their screens when they are away from the car. This also is a good way to keep the display clean. I hope this helps. Ottimo rapporto qualità/prezzo e consegna sicura e rapida in 4 giorni lavorativi (verso l' Italia)Grazie a tutto lo staff Chinavasion.